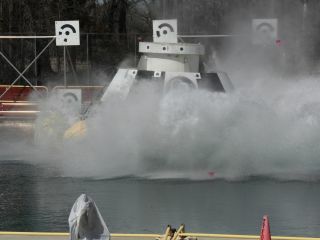 A CST-100 mock up splashes down during a test at NASA's Langley Research Center in Hampton, Va., during tests of the Boeing spacecraft's handling. Boeing has begun testing the astronaut-safety system for its CST-100 spacecraft, which can hold up to seven passengers or a mix of passengers and cargo. Boeing is developing the CST-100 capsule to take NASA astronauts to and from the International Space Station, under a $4.2 billion contract with the space agency. The crew-carrying vehicle features a "pusher abort system" designed to get the CST-100 out of harm's way in the event of a problem during launch. Boeing has been testing out components of this system at NASA's Langley Research Center in Virginia. "[Langley's] unique facilities and expertise enable us to collect dynamic stability data that is crucial to the design of a highly dynamic vehicle like Boeing's abort vehicle," Vanessa Aubuchon, Langley's flight dynamics principle investigator, said in a statement. For example, Langley and Boeing employees tested a 2-foot (0.6 meters) model of the capsule in Langley's Transonic Dynamics Tunnel — the only facility in the United States that can replicate the conditions the CST-100 will experience during flight, NASA officials said. The CST-100 mock up was lifted high into the gantry at Langley to test the water landing characteristics of the design. "During an unlikely abort scenario, the vehicle is likely to experience different aerodynamic shifts, so we test the capsule model at different angles to ensure we can land the spacecraft safely in a real emergency event," Boeing Commercial Crew wind tunnel test lead Olman Carvajal said in the same statement. Langley researchers also dropped a full-scale model of the CST-100 into the facility's Hydro Impact Basin — essentially a giant swimming pool — to test water landings. While a majority of the capsule's landings will occur on the ground, Boeing representatives said that testing water landings from various heights and angles is important in making sure the CST-100's passengers will always be safe. Boeing will continue to test the abort capabilities at White Sands Test Facility in New Mexico, and during a pad abort test in early 2017. NASA also awarded a crew-carrying contract to California-based company SpaceX, which got $2.6 billion to complete development of its Dragon crew capsule. Dragon underwent a successful pad abort test earlier this month at Florida's Cape Canaveral Air Force Station. NASA officials have said they hope the CST-100 and Dragon are up and running by 2017. Follow Kasandra Brabaw on twitter at @KassieBrabaw. Follow us @Spacedotcom, Facebook or Google+. Originally published on Space.com.